Simple Viruses: In its simplest form, a virus is a relatively small piece of software that piggybacks itself onto your computer’s existing larger programs. 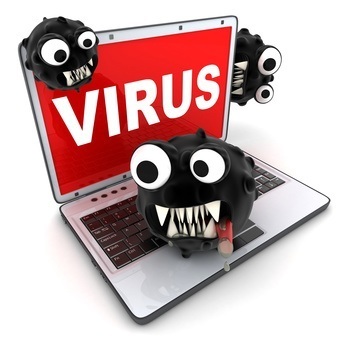 For example, a simple virus can attach itself to a program like your Excel spreadsheet program. Afterwards, each time the spreadsheet program is opened and runs, the virus opens and runs, too, giving it the opportunity to reproduce itself (by further attaching to additional programs) and wreaking havoc on your system. E-mail viruses: An e-mail virus can come from something as innocent as clicking on a link within an email or an email attachment that has traveled with an email message. An email virus will then replicate itself by automatically e-mailing itself to hundreds of people within your e-mail contacts list. Some e-mail viruses are even more malicious and don't even require you to click a link or open an attachment. Instead, they actually launch just by your viewing the infected message in your email software’s preview window. Trojan horses: While a Trojan horse virus lacks the ability to replicate itself automatically, it has the ability to do serious damage, up to and including wiping out your entire hard disk. A Trojan horse virus is a computer program that is disguised as something else (in a lot of cases, an innocent appearing game) that does damage as soon as you run it. Worms: As the name implies, a worm is a piece of software that surreptitiously infiltrates entire networks and security holes in order to replicate itself. A copy of worm software will scan your entire network to find another machine that has a security hole, then using the security hole, infiltrates the second machine, and so on.